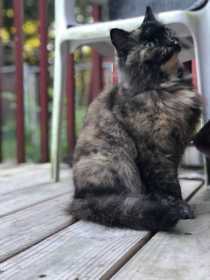 She is tortoiseshell color. Mostly dark brown with some tan and little bit of white. She has a crystal necklace on. One of her ears is tipped from being spayed. Her eyes are turquoise color. She is beautiful and friendly if you have food.